Is this a poltergeist caught on camera? Has an Irish headmaster managed to capture a poltergeist on camera? That is what shocking recently released footage suggests. 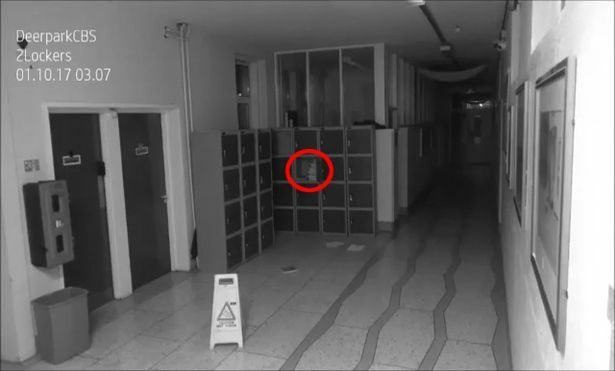 The strange and mysterious footage captured by CCTV cameras installed at Deepatk school in Cork, Republic of Ireland, appears to show a poltergeist wreaking havoc in the school’s corridor in the dead of night. In the shocking video a door appears to open and close on its own, furniture rocks backwards and forwards, a locker flies open and books and papers seem to be thrown from it on to the corridor floor and a wet floor sign is knocked over by an invisible force. ‘We were alerted to movement in the school and when we went back to review the movement that’s what we saw. It was in the middle of the night. We’re bemused ourselves, we don’t know [what it is]. We do feel there is something strange going on because people do get from time to time a real chill in the air when they go past that area. Mr Barry admits it could be a prank but if it is he says it’s a ‘very well-designed prank’. As none of the other school cameras which have motion sensor detectors recorded any pupils. ‘I’m a sceptic myself but we said we’d throw it up on our Facebook page, simply because we don’t know is this a prank or what? Is somebody playing games with us? It’s a very old building, going back a number of years and it’s got a lot of history. People in old buildings are always hearing noises and strange sounds but this is the first time we’ve actually caught something. We’d often come across papers strewn about but we were never able to say what it was, we just assumed it was students that were doing it.